Our Sing-Along Storybook Hour last weekend was super fun and had a great turn out! If you weren’t able to join us, here are some tips to make a musical experience out of books that are songs at home. Sing the words! It may seem obvious, but the simplest tools are often the most important. Your child may or may not recognize that it’s a song they know without the reference of the melody to accompany the words. Remember that while they’re young, your children love your voice no matter what you think of it, so don’t feel shy or self conscious! And if you don’t remember perfectly how the tune goes, turn on your CD to remind you- or just wing it! They either won’t mind, or will help you out! Keep it rhythmic! By using your finger to tap along on the page (pointing either to the words or the pictures), your child sees and hears the steady beat! If you want a break from singing, chanting in rhythm is a great option to keep the experience musical, rather than returning to your more fluid, conversational, spoken vocal pattern. Explore the pictures! The pictures often have even more of a story to tell than the words written down do. So, feel free to pause before moving on to the next page to discuss or sing about all the interesting things your child sees. You can of course talk about it and then continue the song when you turn the page. You can also chant or continue singing the melody with your own new words, or use the resting tone (and the tonic 5th!) to hold a musical conversation! 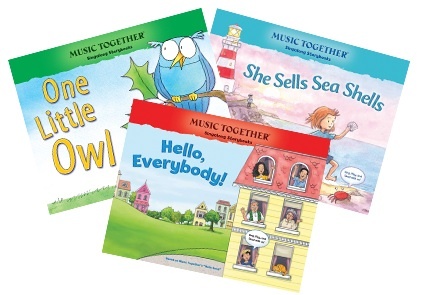 Music Together has created a wonderful collection of favorite Music Together songs in book form, so far including: Hello Everybody, She Sells Seashells, One Little Owl, All Around the Kitchen, Sandpiper, May All Children, and Ridin’ in the Car. Here are some other great examples to look for too: May There Always be Sunshine by Jim Gill; the Pete the Cat series by Eric Litwin; What a Wonderful World illustrated by Ashley Bryan; Hand, Hand, Fingers, Thumb by Al Perkins; Baby Beluga by Raffi; Twinkle, Twinkle, Little Star and many classics by Iza Trapani; and don’t forget the rhyming rhythm of everything by Dr. Seuss! If you don’t personally own any of these, check out what we have next time you are at Heartsong, or at your favorite library branch. And feel free to share other personal favorites in the comments!